Tempro® are suppliers of quality Temporary Floor, Carpet, Window & Surface Protection products, used to protect interior finishes and floors during new build or refurbishment projects. We are distributors of the GENUINE Correx (corex) brand of Corrugated Plastic, the best! We have seen many "equivalent" products over the years and can promise you this, there is a massive difference between imported Corrugated Plastic and Genuine Correx made right here in the UK. We supply Correx in any size sheet and thickness, colour or printed and on the roll! We are the proud owners of the Sticky Shield brand, years in the making, Sticky Shield is simply better than the rest, give it a try! We are here to save you £££'s and will not be beaten on price - tell us what you pay now! 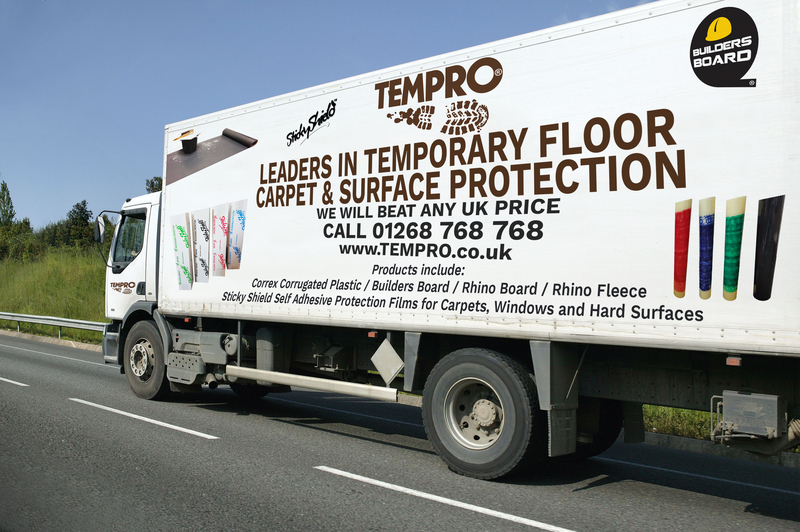 Tempro offer a super rapid, nationwide delivery service Monday-Friday using our own delivery fleet and carriers. Out of hours, same day and weekend deliveries can also be arranged and may incur additional charges.